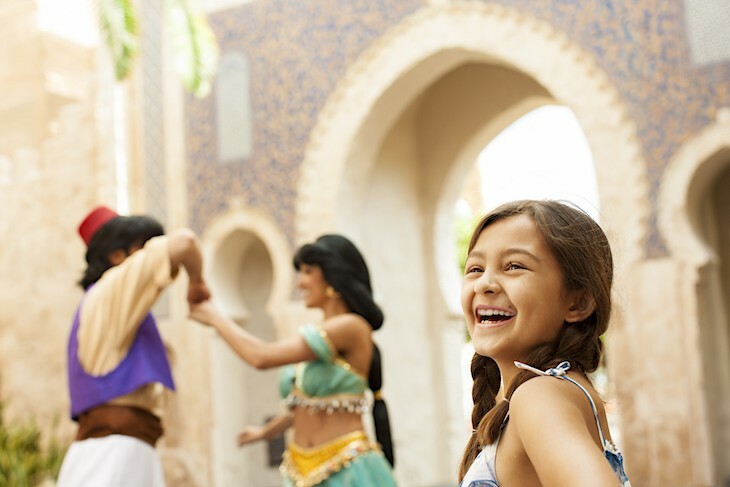 Discover the world at eleven stops around the World Showcase Lagoon. There’s authentic-looking replicas of famous landmarks and buildings, typical streets overflowing with marvelous architectural detail, shops presenting the best of the world’s merchandise, exotic food and wine, and captivating entertainment. Without leaving the country, or the park for that matter, behold the Eiffel Tower, stroll a Japanese garden, witness Venice’s St. Mark’s Square, or visit a Mexican mercado. Definitely plan to spend an evening here when all the countries are lit with shimmering lights and the true romance of this wonderful area of the park shines through. Strolling in a counterclockwise direction around the 1.3-mile World Showcase walkway, you’ll encounter each country in this order: Canada, United Kingdom, France, Morocco, Japan, America, Italy, Germany, China, Norway, and finally Mexico. Those weary of walking can utilize the very slow Friendship water taxis that ply the World Showcase Lagoon. Those who are weary of walking can utilize the Friendship water taxis that ply the World Showcase Lagoon, conveniently located at strategic points: two on each side of Showcase Plaza, one in front of Morocco, and another in front of Germany. Though a bit slow, they will save your weary feet quite a bit of plodding around the 1.3 miles of the World Showcase walkway. Inside this replica of The Temple of Heaven is an excellent 360 degree movie, Reflections of China. 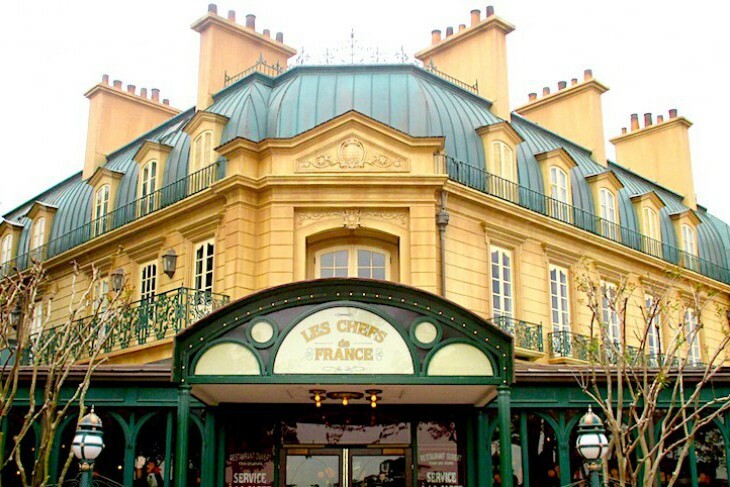 Two restaurants, Les Chefs de France and Monsieur Paul, should be part of your Epcot® agenda. 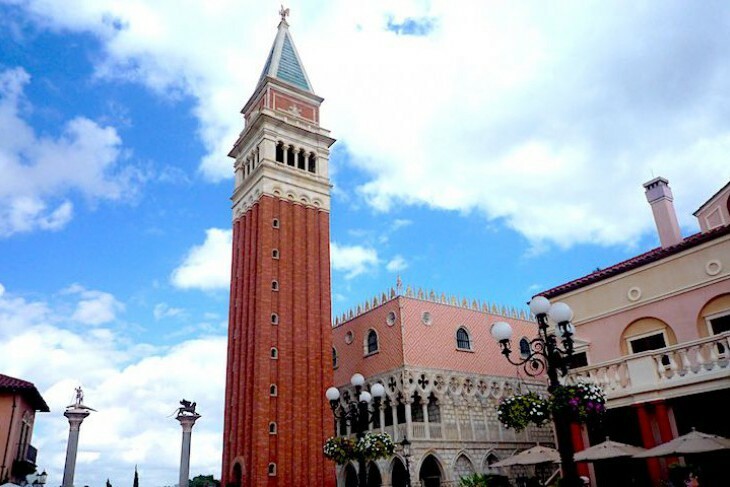 This replica of Venice's St. Mark's Square is astonishing! Stop in to shop in this pavillion's bazaar for baskets, brass items, leather, carpets, and fun clothing. Audio-Animatronics® famous figures tell the story of America. Don't miss this very special nighttime extravaganza! Each evening at closing time, crowds begin to gather around the World Showcase Lagoon to witness the most spectacular nighttime extravaganza at the Walt Disney World® Resort. The story of planet Earth is told in a combination of unbelievable pyrotechnic displays, amazing lasers, stirring music, and fanciful water movement. Each show takes 480 man-hours to perform. Cara's Tip: To avoid smoke from the fireworks check which direction the flames in the torches are blowing and avoid that side of the lagoon. 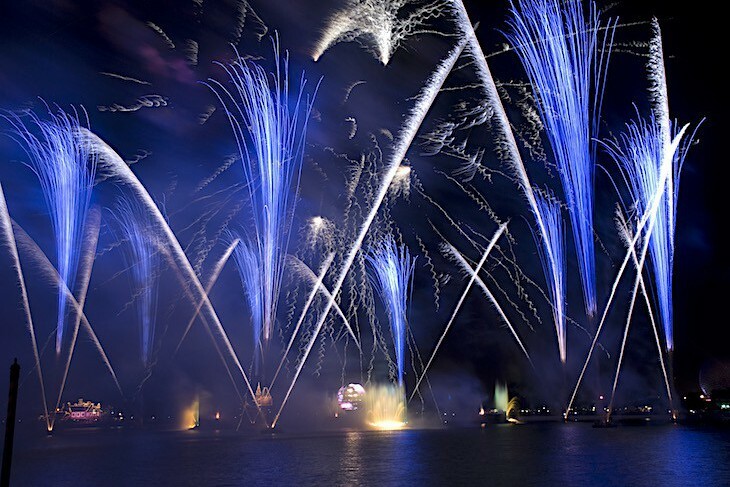 Illuminations: Reflections of Earth does not cancel during inclement weather. Nature’s splendor is the emphasis at Canada’s remarkable pavilion. 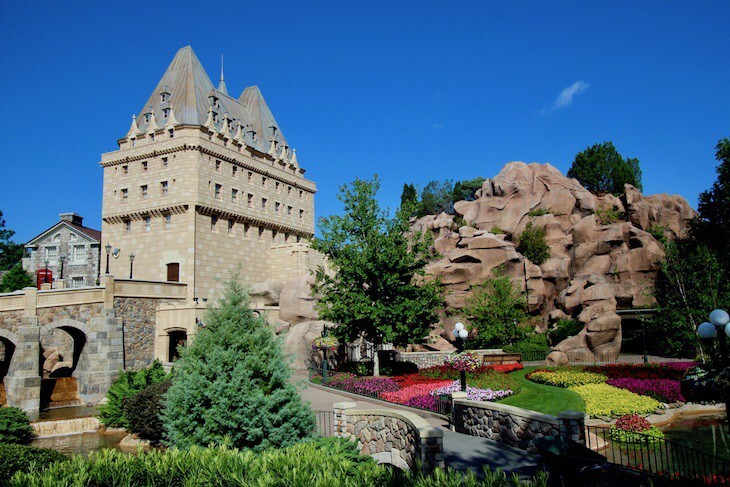 Standing tall and proud is the majestic Hotel du Canada, a combination of several famous chateau-style Canadian Pacific Hotels. Walk up thick stone steps past 30-foot totem poles to rugged mountains, rocky gorges, a sparkling waterfall, rushing streams, and towering evergreens. There’s even a small version of the famous flowering Butchart Gardens of Victoria, British Columbia. Where else could you find such a hodgepodge of English architectural style? There’s quaint, thatched-roofed cottages straight out of the Cotswolds, Queen Anne-style dwellings, lofty red brick castles, even sophisticated Georgian brick townhouses all lining the same street. Bright red phone booths sit beside a proper English park square where a cheerful garden gazebo almost insists you linger a bit and enjoy. 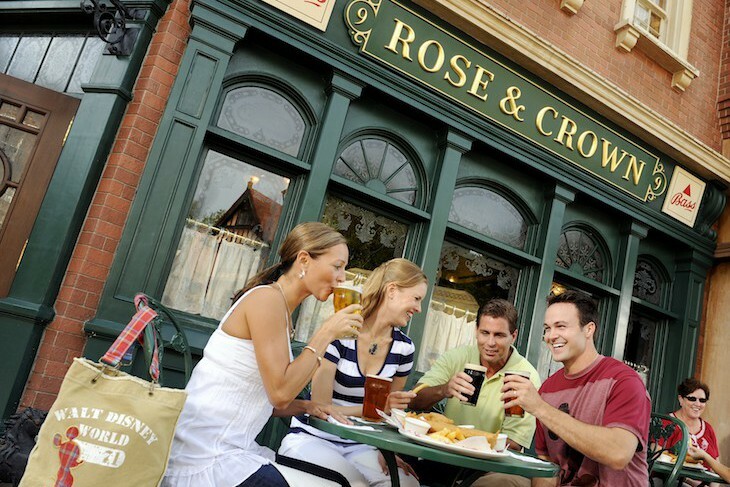 Stroll the street and pop in a variety of shops or have a pint at the neighborhood pub. Cara's Tip: Don't miss the hidden butterfly garden nesting behind the Tea Caddy Shop. It can be reached out the back door of the shop via a walkway leading from the square, or from under a vine-covered archway directly off the World Showcase walkway. Towering over fleur-de-lis topiary and Belle Époque buildings is a 74-foot replica (1/10 the size of the original) of the Eiffel Tower in the charming France pavillion. Shining copper mansard roofs and curtained casement windows top off Parisian-style buildings overlooking a cobblestone street bustling with shops and a sidewalk café. Of course you’ll find world-class cuisine; what could be more French? And if you can’t stroll the banks of the Seine you can certainly walk along the banks of the lagoon where quintessential French accordion music plays amid sketching artists. Pick up a glass of wine at the waterside kiosk and just enjoy. The Casbah awaits you inside the fortress-like sandstone walls of the Morocco pavillion. The Koutoubia Minaret, a replica of the famous century prayer tower of Marrakesh, rises above the lace-like edifices dotted with keyhole windows and vibrant hand-cut mosaic tiles. A courtyard graced by four massive tangerine trees leads the way through the Bab Boujouloud gate to the Medina, or old city, to its souk where animated alleyways filled with bazaars are humming with life and exotic Arabic music. A five-tiered pagoda representing the elements from which Buddhists believe all things in the universe are produced—earth, water, fire, wind and sky—is only a prelude to the serene Japan pavillion. 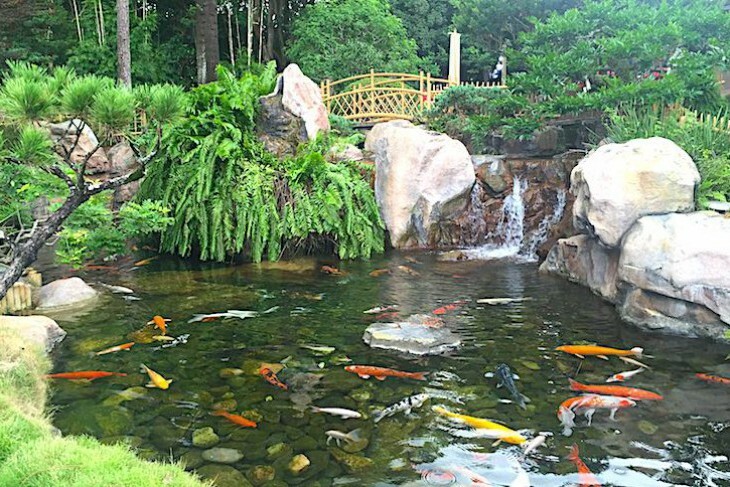 Here are seductive pathways that meander through an elegant landscape of manicured Japanese gardens with arched bridges curving over crystal-clear ponds filled with lazily swimming golden koi and soothing music playing amid the sound of delicate wind chimes. A replica of the great Hall of Ceremonies at the Gosho Imperial Palace in Kyoto houses an immense retail shop owned by the three-centuries-old Mitsukoshi firm of Japan. On World Showcase Lagoon a flaming red torii gate stands guard, authentic-looking in every aspect even down to the clinging oysters and barnacles at its base. Smack dab in the center of World Showcase is a red-white-and-blue pavilion brimming with the spirit of 1776 colonial America. 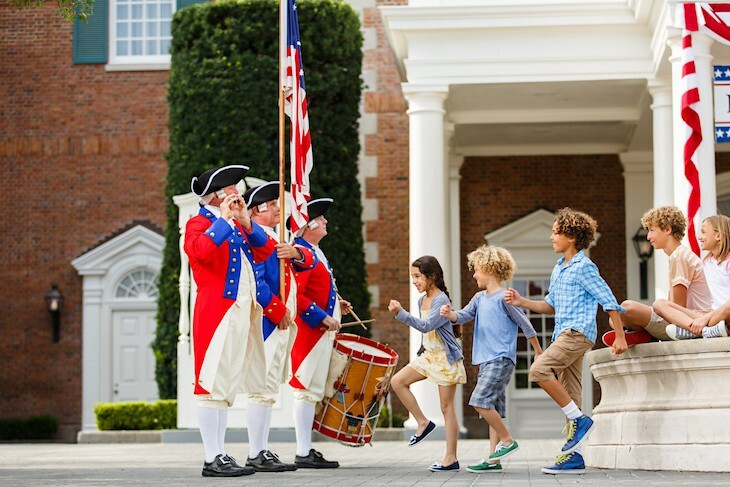 Amid the sound of fife and drum sits a stately Georgian, red brick manse reminiscent of Philadelphia’s Independence Hall where inside a patriotic attraction lures all loyal Americans. Out on the brick streets are kiosks selling the all-American treats of funnel cakes, popcorn, ice cream, and giant turkey legs. A show guaranteed to swell the chest of all Americans. 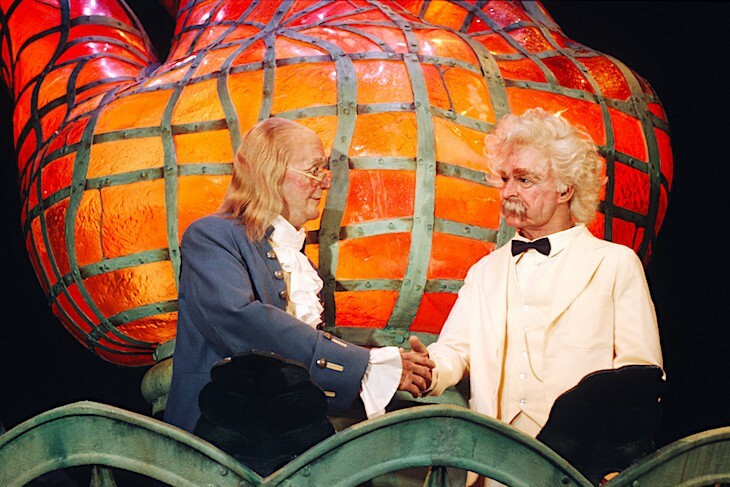 Momentous film, inspiring music, and lifelike, talking, gesturing, and walking Audio-Animatronics® characters weave the impressive tale of America with Ben Franklin and Mark Twain serving as hosts. The grand finale film montage is a real tear-jerker. Some adore this show while others sleep right through it. I’m one of its greatest fans. Cara's Tip: It’s fairly easy to get a seat in this huge theater. Try to catch the Voices of Liberty performance in the waiting area and just watch your patriotism shoot up a few notches. The romance of Venice’s St. Mark’s Square reflected in replicas of the 14th-century pink-tinted Doge’s Palace and its neighboring 83-foot Campanile bell tower is a scene almost begging for surrounding canals. All that’s missing are the pigeons and a frosty bellini. Perched atop soaring columns are statues of St. Theodore and the Lion of St. Mark who gaze down on flower-filled balconies of terra-cotta houses almost perfect enough for Juliet and her Romeo. And out in the lagoon gondolas moored to barbershop-striped poles lie in wait for their gondoliers. 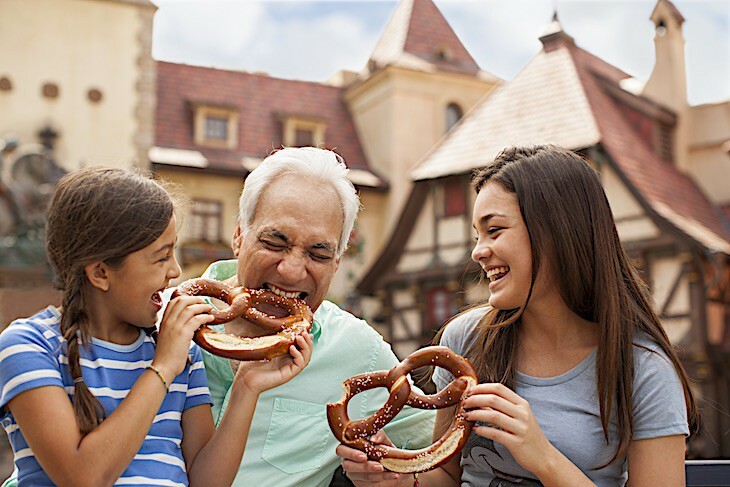 This festive and picturesque Bavarian-style village of rustic balconies brimming with multicolored flower boxes, storybook gingerbread buildings, and a towering castle is a World Showcase favorite. Around the cobblestone platz are quaint shops, lederhosen-clad hosts, a glockenspiel clock tower, and toe-tapping polka music. Of course there’s a mandatory Biergarten where oompah-pah bands, yodelers, and dancers entertain while colossal beer steins are passed. And just around the corner is a delightful toy-train village with a horn-tooting caboose, miniature tunnels and bridges, tiny evergreen trees, and precious Lilliputian buildings. Sparkling in the sunlight as visitors pass under the resplendent Gate of the Golden Sun is an extravagant re-creation of Beijing's Temple of Heaven. Below delicate bridges float blooming lotus in carp-filled reflecting pools, and tinkling music soothes as you stroll amid tranquil Chinese rose gardens, willow and mulberry trees, and delicate waterfalls. 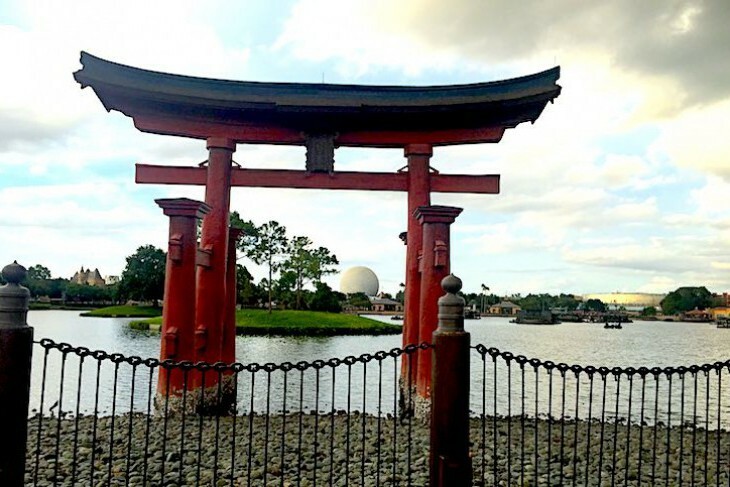 It's a setting of serenity and mystery not found at most stops at World Showcase. Behold the wonders of China in this remarkable 360-degree film narrated by Tang Dynasty poet Li Bai. 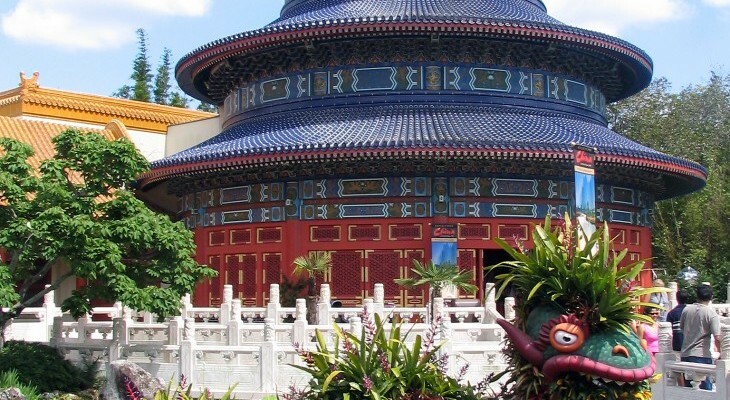 In Circle-Vision walk atop the Great Wall, enter the Forbidden City, stand in the middle of Tiananmen Square and cruise down the mighty Yangtze River. View the modern world of Hong Kong, Macau and Shanghai. Stunning views of rice terraces, Inner Mongolia’s nomadic people, the misty Huangshan Mountains, the Gobi desert, the extraordinary Terra Cotta Warriors, and the haunting landscape of Guey Ling only serve to make you want more. Come prepared to stand throughout the presentation. Soaring over Norway’s cobblestone courtyard is a castle modeled after Akershus, Oslo’s 14th-century stronghold still standing above its picturesque harbor. 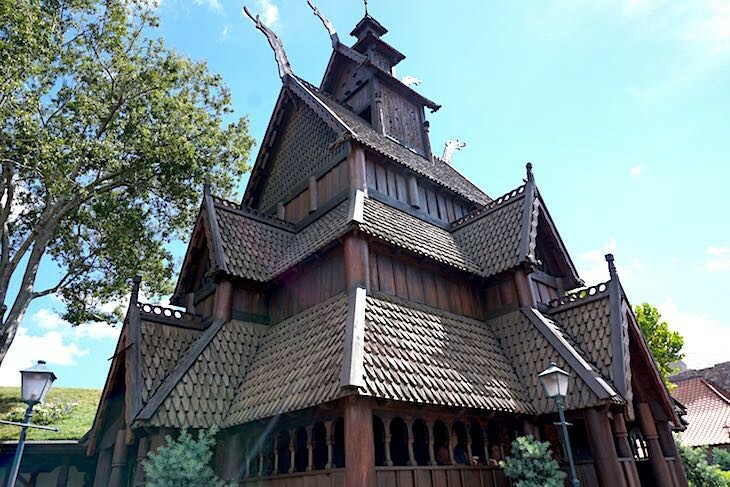 Below is a quaint mixture of buildings representing Scandinavian architecture including a wooden Stave church and a variety of red-roofed rock dwellings centered around a charming town square. 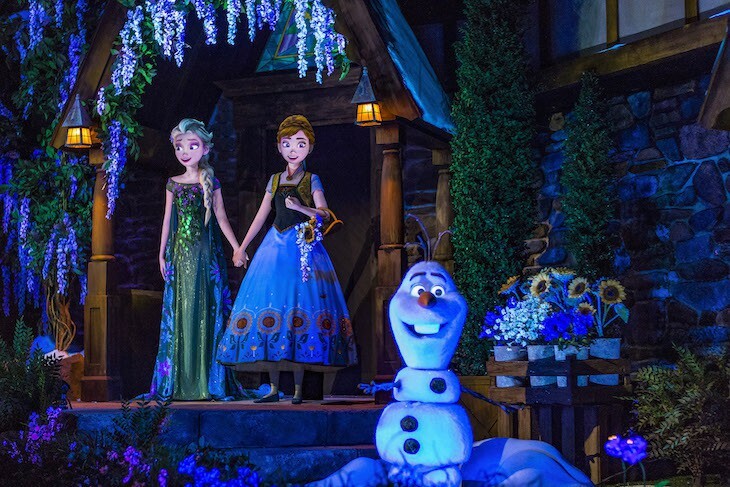 And now the Frozen Ever After attraction is the park's biggest draw. The sight of a colossal pyramid enveloped in lush jungle foliage is an immediate draw when visitors turn the bend into the World Showcase. 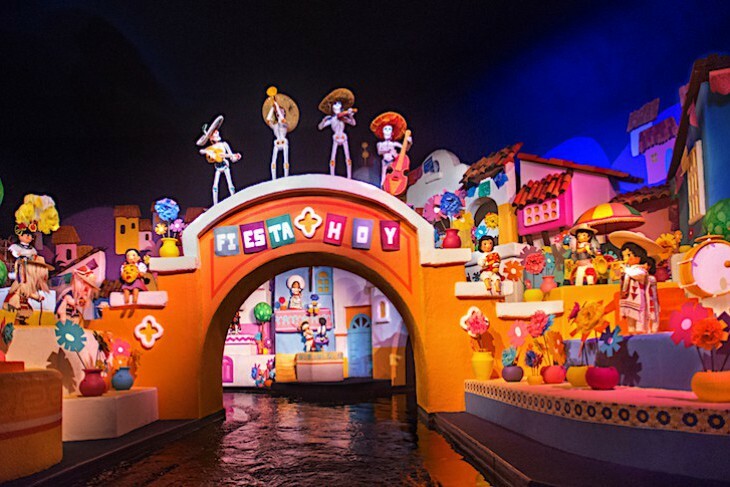 Inside is another place and time, a magical, nighttime village surrounding the Plaza de los Amigos. The air is filled with the exhilarating strain of mariachi music in the bustling, gaslit square brimming with lively shops loaded down with tempting south-of-the-border wares. A great tequila bar offers margaritas and tequila shots. And the inky-blue El Rio del Tiempo (the River of Time) floats lazily beneath a rumbling volcano beside the romantic candlelit restaurant, the San Angel Inn.